Here, let me introduce you to another delicious local delicacy which you can easily get them from almost anywhere. Chai kuih is something looks quite similar to 'har gao' but with different mixed vegetables fillings and is much cheaper compare to 'har gao'. I remembered I used to buy this kuih from a lady riding on a bicycle when I was younger. It costs about twenty cents per piece and I will request for extra sesame seeds & her special homemade chilli sauce. And now, her son has taken over her business by riding on a motorcycle. Just imagine how time flies! (1) combine both flour and salt into a big bowl. (2) then slowly stir in boiling water with a pair of chopsticks till a sticky dough is formed. (3) leave dough aside covered, to slightly cool. (4) add in oil little by little and knead till a smooth dough is formed. Once the dough is ready, divide dough into 26-30 portions. Flatten each dough and place in the jicama fillings or char siew fillings. And make sure the dough is nicely sealed. Here's the jicama fillings and vegetarian char siew fillings I prepared a days before. Yet is still the best to add in some chinese chives. Now, preheat steamer with a cheese cloth place on the steamer rack. Arrange all the dumplings onto the rack once the steamer is ready and then steam for 10-12 mins. HOT...HOT...HOT.... watch out the heat from the steamer! Oh, I just love it hot. Remove all the cooked dumplings to a plate and brush on a little oil to prevent sticking together. Some 'chai kuih' recipes may required for glutinous rice flour but I would preferred to go without it cause I wanted the skin looks more translucent and shinny. I'm sending this to 3 Hungry Tummies @ Muhibbah Malaysia Monday. This looks interesting with the char siew in it, must be very delicious. We usually have chives in it. The look absolutely delicious, I wish I coud make them at home, but I will never find the tapioca flour here! too bad. This is one of my favorite local delights:D So delicious! 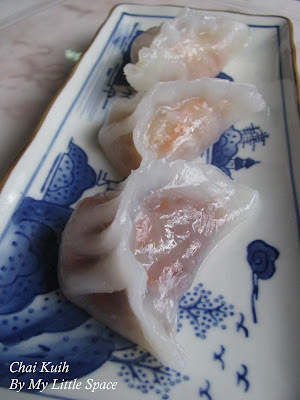 Your pleating look so neat, delicious dim sum. They are so beautifully pleated! Charsiew filling sounds fantastic. yumyum my favorite snack!you are so talent to make the skin so thin enough, how i wish i could too! I always love to make chai kuih cos my hubby likes it very much. i love how translucent it looks. I usually get the ones with chives filling . Have never tried with char siew filling, what we get is the chives or turnip filling. Think I'll go get some for my breakfast tomorrow! They are very beautifully shaped. Got to bookmark this recipe! Yum! Put the water in a pan and when warm stir in the flour, salt and oil, keep stiring with a wooden spoon until it's all integrated, turn off the fire and take the dough off the pan, which should not be too hot. Roll it with your hands on the table with some extra flour so it won't stick to your fingers, making a long cilinder. Cut it into 12 pieces and then make the shells as thin as you can with the aid of a rolling pin, cut them round and then cook them on a very hot smooth surface (saucepan or electric grill or other), turn them over when on side is cooked, this you must do very quickly so they won't overcook, which will make them hard, they must be very flexible, like a crêpe. You can keep them on the fridge for a couple of days, make sure you wrap them tight with aliminium foil or in a tupper ware. This recipe is good for wheat and white corn flour. Good luck, and tell me how it turned out. Any doubts, just ask! i like this kuih too, because the vegetable filling and chewy skin, YUM! you have perfectly done this. Yum! Do you have any idea how to write 'tapioca flour' in Chinese characters? I need it to communicate with my grocer. Thanks! Kristy - have you thought about opening up a restaurant? :-) This looks really amazing and delicious! I love that semi-transparent dumpling skin! Wow - does this ever appeal! And they are so beautiful. You have that wonderful baking patience - or just a gift! Probably both. Yum! Wish I have the patient to make it. recently made chee cheong fun and that wheat starch was exactly what I've been missing ): your dumplings look really pretty and translucent and i bet taste delicious! I just some of these today. But I did not make them of course. I think I need to roll up my sleeves and make them myself. I personally don't eat char kuih... perhaps its chewy texture and the tung mein fun taste. However your char kuih look beautiful and the skin is so thin, I reckon it requires certain level of kung fu to achieve tht, hat off! I tried your recipe but found the dough to be really wet and sticky. When I added the oil, it was still so wet that the dough just cant form. Can you tell me what I did wrong? i also cant seem to get the transparent chainkueh recipe right and am really nervous abt doing it aain. However, I intend to try until I perfect it and wonder if you can explain what I did wrong..I followed your instructions as written. If I am not mistaken, you must have pour in the boiling water at one shot. The dough won't form in this way. You've to add in the boiling water bit by bit and at the same time stirring it till a soft dough is formed. You are right. I poured it all at once. Will add bit by bit then. Wish me luck this Sunday!!! thanks for replying so promptly too! I failed again. This time the dough formed after adding the hot water. After leaing it to cool down, I added the oil but by but while kneading and realised that I cannot roll out the skin. It tears easily.....i had to throw it away....what am I doing wrong again? How is the end dough supposed to feel like? It doesnt look anything like the picture you have. Sorry about your 2nd trial. Well, we learnt from mistaken. Never mind, you give it another try when free. You're not supposed to cool the dough. Everything has be done before the dough turned cool and make sure you cover the dough with a damp tower to maintain the moisture before you start using it. The dough turns dry and difficult to manage after cooled. In your step 3, you state to leave it to cool to room temperature and then only add the oil. You mean, we are not supposed to let it cool but to add the oil when the dough is still hot? Are we supposed to let it cool down after adding the oil and not before? You may use a curry puff mould to help you in the sealing part. Thanks Kristy. Will have to wait till the next time then. Is there any special brand of wheat startch that you use? Also, is this the same recipe as making the dimsum har ko? Hi Kristy, I would like to make these for CNY. Is it ok to make 1 week earlier and put them in the fridge? Do you have a recipe for the turnip filling? Thanks! First of all, thanks so much for stopping by and glad you like this kuih as well. Honestly, I'm not sure if its ok to prepare this early but I have friend tried it before. She made them one month earlier and then kept frozen. She made these for CNY as well and just defrost & steam it later to serve. You may try the recipe as below with additional of dried shrimps for better flavouring. Wish you luck!>o< Enjoy & have fun. Hi Kristy, thanks for replying. 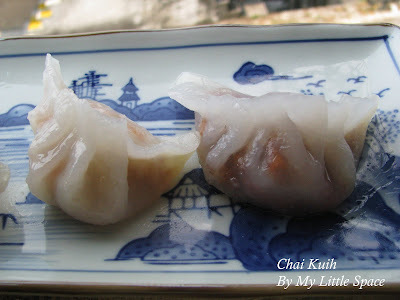 I will be trying it out this Saturday first before I embark on making for CNY. My concern is how to roll them round. Do you have some tips that you can offer? I have a dumpling mould so sealing it should be simple. Thanks again for your help! You're most welcome. For flattening dough, you can roll them between a plastic sheet which gives you thin & nice dumpling wrapper. Hope this will help. Hi Kristy, mine was a totally failure......the dough didn't form when I poured in boiling water bit bit...it was still watery after adding in the oil..then I decided to put lots and lots and lots of tapioca flour and finally a dough formed but it is ultra sticky that it was impossible to knead. So I dusted the table with lots ad lots and lots of tapioca flour. Managed to knead it to a smooth dough but found out the skin broke super easily. Terrible mess indeed! I really admire your skill in ding this. You are really good at it! I'm so sorry about your failure attempt. I did it on my first attempt but failed on my 3rd attempt due to adding in the boiling water too quickly. The trick is only add in water after each stir when the flour started comes together. Don't stir in water continuously. Don't give up so easily, Ai Li! I believe you can do it too. Hi Kristy, thanks for encouraging me! I thought of buying the dumpling skin from the brand Wu Li Hao. Have you tried? Do you know if it is transparent kind of skin? By the way, do you have a recipe for chives filling wihtou any prawn or minced pork (my sister is allergic to prawns)? Thanks so much for your help and patience! Hi Kristy, this has been on my bookmark list for so long but i was hesitant to try it out as i saw so many failed. Miraculously i succeeded in making the skin on my first attempt! My family loves it so much. Thank you so much for sharing! First of all, thanks for trying this recipe and congratulations to your great success. I'm sure in future you can create more varieties of filling on it too.